, so please check to see if you've already purchased them separately before buying this bundle. ***Father's Day set just added! ***Save by purchasing these resources as a BUNDLE! 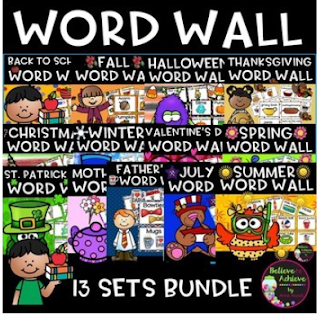 You will LOVE these colorful word wall sets (13 of them!) with pictures and words from Back to School to Summer! 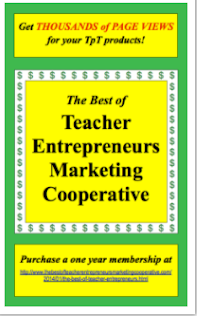 Just print on card stock, laminate, cut out, and display! There are 24 cards in each set! 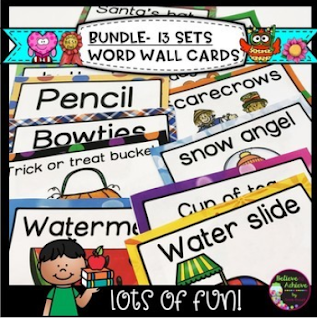 These activities would work for This set would work beautifully with younger students learning to read, ELL and ESL students, and special education students. ✎ "Thank you! Can't wait to use:)" Anamaria A. ✎ "Thanks so much!" Diane Q. ✎ " This was a great purchase as I am new to teaching primary. The Bundle was an excellent value." Amira L.